Hannibal‘s appetite wasn’t as strong last night. FOX: After a slight surge last week, AMERICAN IDOL was back down to 2.9, a 0.3 drop and just slightly above its series low. (And to add insult to injury, it’s behind a rerun Big Bang Theory on CBS.) However, it may make up some of that ground when final numbers are released this afternoon, since the episode had an overrun past 9PM. GLEE was down 0.2 to 2.2, and may correspondingly get even lower when the Idol overrun is calculated. NBC: COMMUNITY is making a case for itself as one of the NBC sitcoms that deserves a renewal, rising 0.1 to 1.3–which, pathetic as it sounds, is as least as good as most of the rest of the bunch. The one seemingly sure renewal is PARKS & RECREATION, which aired two episodes last night and scored twin 1.7s. That’s just a tick or two lower than The Office has done lately, making it golden by NBC standards. However, there was bad news for HANNIBAL, which despite a much stronger lead-in this week (1.7 vs. the Go On season finale’s 1.1), fell 0.3 to 1.4, losing to a CBS rerun. CW: After a 3-week gap, VAMPIRE DIARIES returned with a season-low 0.9, down 0.3 from its last fresh episode. BEAUTY & THE BEAST held on better with the same 0.6 it had 3 weeks ago. ABC: Only WIFE SWAP was new last night, and it rose slightly to 1.5. After that, soap reruns were at 1.1/0.9. 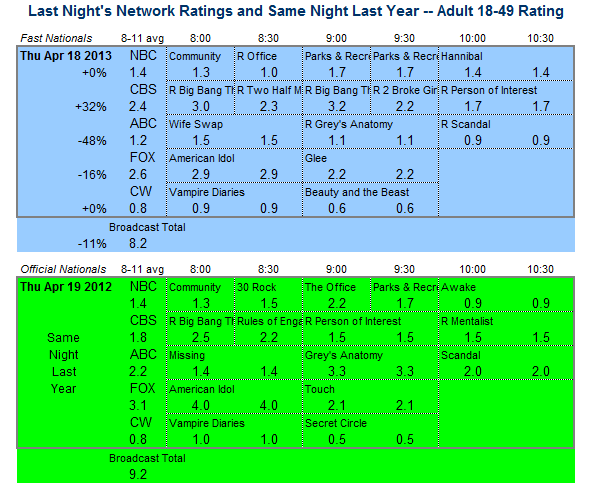 CBS: The network experimented with two sitcom reruns in the 9PM hour, and while they didn’t face new programming on ABC, they did extremely well, with a 3.2 for THE BIG BANG THEORY (after a 3.0 rerun in its usual 8PM slot) and a 2.2 for 2 BROKE GIRLS, winning the 9PM half-hour and potentially at 9:30 as well once final Glee numbers are in. The network’s rerun PERSON OF INTEREST also took the 10PM hour with 1.7. A forecast of next season’s Thursday? CBS has announced that tonight’s VEGAS will be preempted for coverage of the hunt for the remaining Boston Marathon bomber. As of this writing, the other networks are keeping their schedules intact (both NBC and ABC already have news hours in Friday primetime), which means fresh episodes for most of the night’s other series.